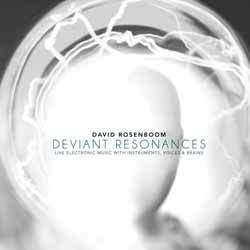 David Rosenboom's Deviant Resonances carries the concept of “creative listening" into new dimensions. In addition to the unconventional ways in which the everyday listener is called on to interpret the music, Rosenboom uses the action of “listening” as an instrument. This is an album you'll totally get, or will completely go over your head. As a huge fan of the BBC Radiophonic Worshop in the '70s and '80s, Deviant Resonances held a lot of charm for me. But I can empathise with anyone who is left scratching their head. The first track, 'Portable Gold and Philosophers’ Stones' (Deviant Resonances) (2015), sees Rosenboom achieve a resonant sound by analysing electrical signals coming from the brains of two imaginative performers. A third performer calibrates a computer system to the responses of what he calls “imaginative listening." This system adapts to the brainwave activity of the first two performers and builds a symphony ranging from quiet beginnings to climaxing crescendos. This pretty much sets the scene for what is to come. The album, spread over two discs, contains 7 tracks (2 hrs, 42 sec) and represents an intriguing electronic experience. You don't really need to know the background to every track (although it does help to give the listener a glimpse into the creative thought process of the composer) as the electronic tracks drag you in, swamping your senses. Personally I enjoyed this. While it's not the sort of album I'd listen to in order to relax, as an experimental collection it's engaging and almost hypnotic.